In addition to its vital function in image-forming vision, the retina forms the entry point for light information to coordinate the central circadian clock (located in the hypothalamus) with solar time. The retina also possesses an endogenous clock which drives many essential processes adapting visual function to ambient conditions. Our search for novel animal models to study circadian rhythms led to an unexpected discovery in the form of diurnal rodents that exhibit high cone numbers, some 10-20 fold those seen in classical laboratory rats and mice. 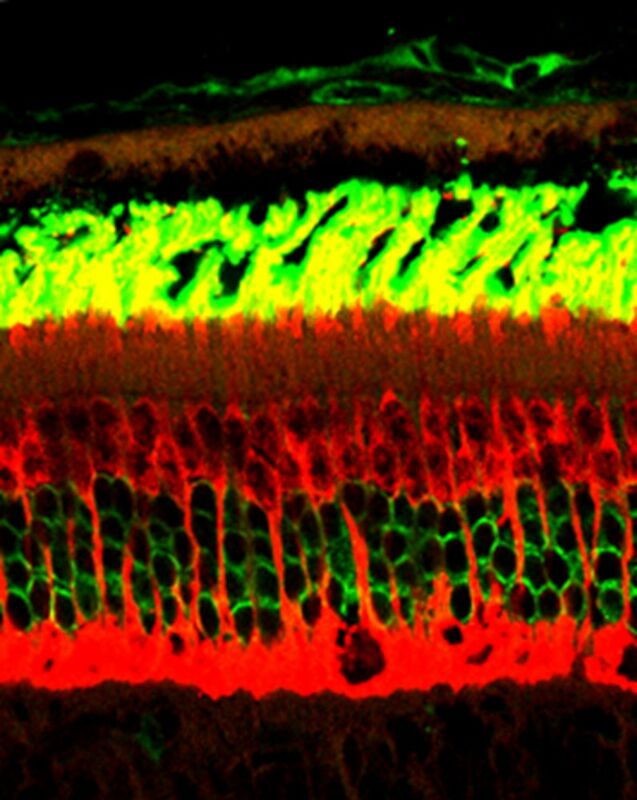 This article outlines the research done in my team over the last five years on these twin aspects, circadian control of retinal pathophysiology, and application of cone-rich rodents to examine major retinal diseases. The central circadian clock is located in the suprachiasmatic nuclei (SCN) within the ventral hypothalamus. This “master” clock generates a regular near-24 hour periodicity through interlocking positive and negative molecular feedback loops (1), and this timing system is imposed on general bodily functions such as the sleep-wake cycle, hormonal secretion and thermoregulation. This “inner” clock requires daily synchronization with “outer” solar time in order to coordinate physiology with the environment, forming the basis of adaptation (2). The retina performs this “non-image forming” (NIF) visual function through a recently discovered photoreceptive system working in parallel to classical rods and cones. This system consists of the “intrinsically photosensitive retinal ganglion cells” (ipRGC), a small subset of RGC that project along the retinohypothalamic tract and express the visual pigment melanopsin (3). Intensive research over the last ten years has revealed the unique nature of these cells, where they are now known to modulate a wide range of NIF visual functions including control of pupillary constriction, sacchade regulation and sleep modulation (4), and are increasingly thought to influence normal vision too (5). They work in conjunction with rod and cone input in normal retinas to synchronize the SCN with solar time, since all three photoreceptor types need to be rendered non-functional in order to abolish photoentrainment (coordination of locomotor activity with the day/night cycle) (6). The relative contribution of each class of photoreceptor was not clear, and our group was the first to show that rod input is critical for photoentrainment under dim light conditions. The DNA methylating drug N-methyl-nitrosourea (MNU) has been widely reported to induce rapid and complete loss of rod photoreceptors in rats and mice (7), and we used this experimental paradigm to investigate the effects of such loss on the ability of Long Evans rats to photoentrain under decreasing ambient light intensities. Although ipRGC were also affected by the treatment, sufficient numbers remained to mediate photic information to the SCN. We observed that, in contrast to control rats which were able to photoentrain at all light levels, MNU-injected animals were unable to re-align their sleep/wake cycles under light regimes of 1 lux, at which luminosity only the rod photoreceptors are functional (8; Figure 1). Figure 1: Photoentrainment ability in control (n = 10) and MNU-treated (n = 4) animals at different intensities of LD cycles. (A) Double-plotted actogram of control (left panel) and MNU-treated (right panel) rats under LD cycles of different intensities (300, 15 and 1 lux). Both control and MNU-injected rats showed essentially nocturnal activity (wheel running) under 300 lux. When both groups were subjected to a 6h phase delay coupled with reduced ambient lighting (15 lux), control rats synchronized to the new LD schedule in ~7 days, and MNU-treated rats in ~11 days. Repeating the same procedure (6h delay and 1 lux ambient light) led to control rats taking longer to entrain (~17 days), whereas treated rats were unable to entrain. Retruning the animals to 300 lux showed similar times for both groups, showing the treated animals were still able to respond to higher light levels. Taken from (8). Figure 2: Double label immuno-histochemistry of Arvicanthis ansorgei outer retina showing rods (green) and cones (red). Cones were stained with anti-cone arrestin (generous gift of Dr. C. Craft, USC, Los Angeles USA), which outlines the double row of cell bodies, descending axons and synaptic pedicles, as well as the flame-like outer segments. Rods were stained with rho- 4D2 rhodopsin antibody, outlining four rows of cell bodies and long outer segments at the top. In addition to relaying photic information to the SCN, the retina exhibits numerous circadian activities of its own. Indeed the retina was the first tissue outside the SCN in which an autonomous circadian clock was demonstrated (9). Nevertheless the precise localization of the retinal clock (or clocks) remains controversial, with published evidence indicating clock activity respectively in the outer nuclear (ONL, 10) and inner nuclear layer (INL, 11). Using a vibratome-based approach to separate the retina into its constitutive cell layers, combined more recently with real-time bioluminescence measurements from transgenic mice expressing luciferase constructs under control of circadian gene (Per1, Per2) promoters, we showed that each retinal cell layer expresses an autonomous clock, and that coordinated “ticking” is strongly modulated by both light and cell coupling (12; Jaeger et al., in preparation). A non-exhaustive list of clock-driven retinal processes includes synthesis of melatonin (9, 10) and visual pigments, ion channel sensitivity, cell-cell coupling (13) and photoreceptor shedding and phagocytosis by the overlying retinal pigmented epithelium (RPE) (14). We are especially interested in the latter behavior, since defects in the phagocytic process are known to lead to retinal degeneration in both animals and humans. Much information is available on rod shedding, which is universally seen to occur at maximal levels shortly after light onset; data for cones however are far less common, and reveals differences among species. In order to compare directly rhythmic rod and cone shedding, we took advantage of the retinal anatomy of the diurnal murid rodent Arvicanthis ansorgei: in contrast to “conventional” laboratory rats and mice (2-3% cones), this species possesses ~30% cones, arranged in a highly ordered manner within the ONL (15; Figure 2). Using a double label immunohistochemical approach combined with quantitative morphometry we demonstrated that both rods and cones exhibit peak activities shortly after light onset (15); that these profiles are under control of an endogenous clock since they continue in conditions of constant darkness (16); that these profiles are greatly disrupted by constant light (16); but that despite the disruption and increased turnover rate of cone shedding, prolonged constant light exposure does not lead to retinal degeneration (17). Furthermore, another “cone-rich” animal model, the Nrl knockout mouse in which cells normally fated to become rods follow a default pathway to differentiate as blue cones, also shows a morning burst of phagocytic activity (18). Taken together, these data demonstrate the importance of circadian regulation of photoreceptor shedding. 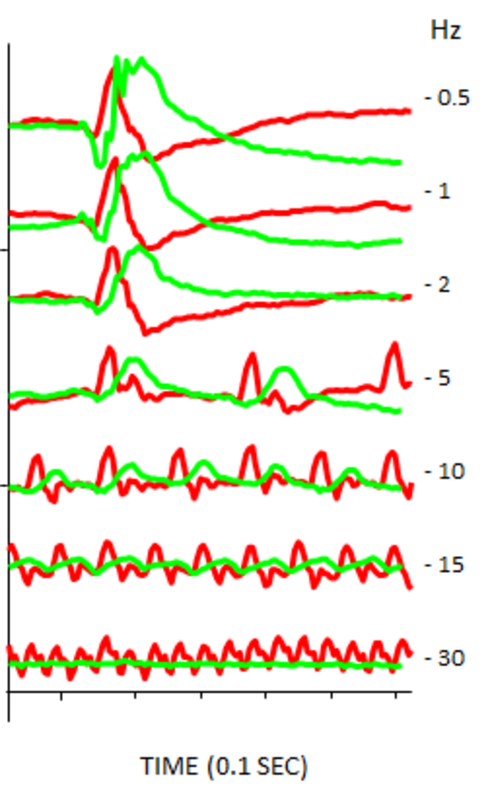 Figure 3: Flicker frequency measures of mouse (green trace) and Arvicanthis ansorgei (red trace). For a given bright intensity, mouse cones show a decreasing response amplitude with increased flash frequency, to become essentially flat by 30 Hz. Whereas Arvicanthis still shows a robust signal at 30 Hz, similar to human recordings. Our department (Neurobiology of Rhythms, CNRS UPR 3212) is interested in the physiological mechanisms that control nocturnal and diurnal behaviours. Arvicanthis and a number of other diurnal rodent species can be considered closer to humans in that both are active in the daytime, with a coordinated general physiology adapted to such lifestyles. Their high cone numbers make their retinas resemble somewhat the macular region in humans, and their visual responses are as one would expect very cone-dominated. For example, the critical flicker fusion (CFF) test has been validated as a potential test of human vision; mice have a lower CFF (~10 Hz) than humans, whereas Arvicanthis is similar to humans in exhibiting thresholds of >30 Hz (Figure 3). We have attempted over recent years to exploit these favourable characteristics by conducting research along several avenues: 1) to generate germline transgenic strains of Arvicanthis as novel models of inherited macular degeneration. In collaboration with partners at Inserm U. 972 Paris (Drs. J. Kaplan and J.M. Rozet) and INRA Dijon (Drs. L. Brétillon and N. Acar) we have designed lentiviral vectors carrying shRNA against abca4, the gene responsible for Stargardt’s Disease. After unexpected initial setbacks, these studies are beginning to bear fruit; 2) to use environmental-based stress to examine rod and cone degeneration. These strategies have used intense light damage, toxic drugs (MNU), and dietary manipulation (high fat diets, enriched Vitamin A diets). One general finding which has emerged from these multiple experiments is that the retinas of Arvicanthis are extremely resistant to environmental insult. This is true for both intense light, which does not inflict detectable photoreceptor loss at combined levels some 100 times higher than those necessary to destroy these cells in albino mice (19); and for MNU, which even when used at double-strength dose induces a partial progressive cell loss very different from the radical effect seen in rats (20; Figure 4). These data have been frustrating in the sense that they have slowed down our efforts to model cone degeneration; but they raise flags that retinal degeneration in a diurnal animal more closely resembling ourselves is not like in nocturnal rats and mice. Figure 4. 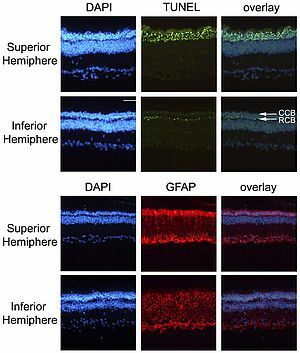 Localisation of apoptotic cells and GFAP during retinal degeneration induced by MNU. Upper panel, top row: in the superior retina, the entire remaining ONL was filled with apoptotic figures. Upper panel, lower row: in the inferior hemisphere, only the innermost cell Rows of the ONL, corresponding to the position of rod cell bodies (RCB) contained many TUNEL-positive cells, whereas the upper rows corresponding to cone cell bodies (CCB) were devoid of dying cells. 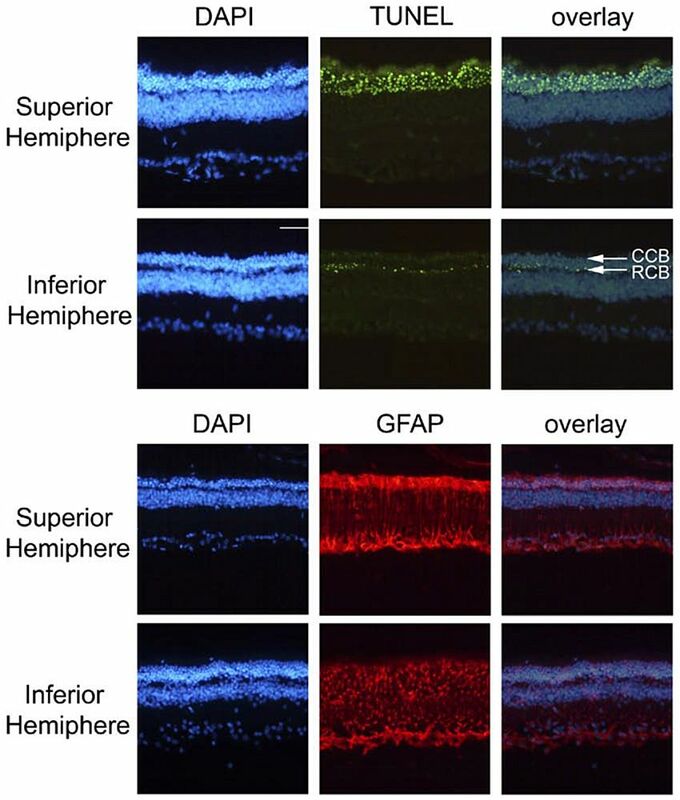 Lower panels: Glial fibrillary acidic protein (GFAP) was localised in astrocytes within the nerve fibre layer and in Müller glia throughout the retina in both the superior (top row) and inferior (lower row) hemispheres. GFAP expression was stronger in the superior hemisphere, but was greatly up-regulated throughout MNU-injected compared to control retinas. Scale bar, 50 µm. Taken from (20). One last avenue that should be mentioned concerns another species of cone-rich diurnal rodent (Psammomys obesus) which has the added feature of spontaneously developing metabolic syndrome and type 2 diabetes when maintained on a regular rat chow diet. Pertinent animal models of diabetic retinopathy (DR), one of the most serious complications of diabetes and the major cause of sight loss in the working population, are quite rare. Most display features typical of early pre-proliferative DR, but do not progress into the aggressive late stage form. DR is also reported as a micro-angiopathic disease, since clinical investigation reveals capillary changes including pericyte loss and formation of microaneurysms. However many papers have signaled an early alteration in colour sensitivity, suggesting that diabetes may have a precocious effect on cone function. It was this idea that led us to examine whether Psammomys obesus developed DR, and furthermore if this DR resembled the pathology seen in humans. We showed recently that individuals raised on rat chow (which is hypercaloric compared to their natural diet) display a wide range of vascular and neural changes seen in human DR, including pericyte drop-out, blood-retinal barrier weakening, vessel irregularity, reduced glutamate clearance, RGC degeneration, and a preferential loss of cones (21; Figure 5). 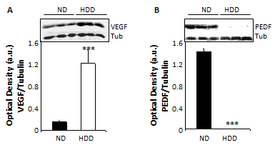 Figure 5: Pro- and anti-angiogenic growth factors in vitreous of control and diabetic retinas. VEGF-immunoreactive bands in vitreous samples from three control (ND, left) and three diabetic (HDD, right) individuals. 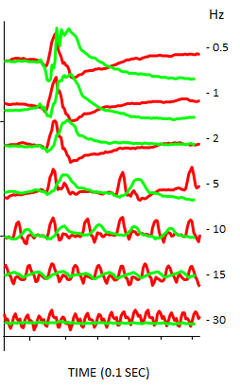 B. PEDF-immunoreactive bands in vitreous samples from three control (ND, left) and three diabetic (HDD, right) individuals. 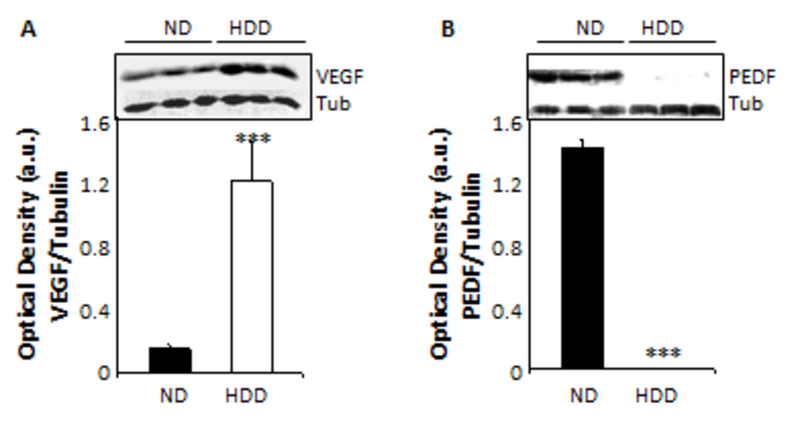 The bands were analyzed by densitometry and normalized to tubulin in stripped membranes from the same samples (shown below the VEGF/PEDF blots): black column, relative levels in ND controls; white column, relative levels in HDD animals. In all subsequent histograms, ND retinas are shown in black, HDD retinas in white. ***p<0.001. Relative levels given in arbitrary units. Taken from (21). Our research has led us along two partially overlapping routes: on the one hand to understand how circadian clocks control important retinal processes such as photoreceptor phagocytosis (16-19); and on the other the application of cone-rich diurnal rodents as valuable models for a range of devastating human blinding conditions including age-related macular degeneration (AMD), Stargardt’s Disease and DR. We still have a long way to go: for instance we would like to identify the through pathway from circadian gene activity to phagocytosis. We have recently observed in two separate circadian gene knockout strains that the morning peak of rod shedding is reduced or absent, and these mice provide a means to track down the intermediate targets. In terms of retinal pathology, we sincerely believe diurnal rodents present a number of advantages compared to their “conventional” nocturnal relatives, notably the ability to analyse cone pathological responses in detail at the structural, molecular and functional levels. The author would like to express his deepest appreciation for the help of his team, especially Dr. Marie Paule Felder-Schmittbuhl; and to gratefully acknowledge the financial assistance by the ANR, Retina France and the Fritz-Tobler Foundation. Reppert SM, Weaver DR. Molecular analysis of mammalian circadian rhythms. Annu Rev Physiol. 2001 63 :647-76. Van Gelder RN. Non-visual ocular photoreception. Ophthalmic Genet. 2001 22: 195-205. Ecker JL, Dumitrescu ON, Wong KY, Alam NM, Chen SK, LeGates T, Renna JM, Prusky GT, Berson DM, Hattar S. Melanopsin-expressing retinal ganglion-cell photoreceptors: cellular diversity and role in pattern vision. Neuron. 2010 67: 49-60.
and detection of 7-methyldeoxyguanosine in the rat retina. Toxicol. Pathol. 1993 21: 21–25. Boudard DL, Mendoza J, Hicks D. Loss of photic entrainment at low illuminances in rats with acute photoreceptor degeneration. Eur J Neurosci. 2009 30:1527-36. Tosini G, Menaker M. Circadian rhythms in cultured mammalian retina. Science. 1996 272: 419-21. Tosini G, Davidson AJ, Fukuhara C, Kasamatsu M, Castanon-Cervantes O. Localization of a circadian clock in mammalian photoreceptors. FASEB J. 2007 21: 3866-71. Ruan, G.X., Zhang, D.Q., Zhou, T., Yamazaki, S., McMahon, D.G. Circadian organization of the mammalian retina. Proc. Natl. Acad. Sci. USA 2006 103: 9703–9708. Sandu C, Hicks D, Felder-Schmittbuhl MP. Rat photoreceptor circadian oscillator strongly relies on lighting conditions. Eur J Neurosci. 2011 34: 507-16. Ribelayga C, Cao Y, Mangel SC. The circadian clock in the retina controls rod-cone coupling. Neuron. 2008 59: 790-801. LaVail MM. Rod outer segment disk shedding in rat retina: relationship to cyclic lighting. Science. 1976 194: 1071-4. Bobu C., Craft C., Masson-Pevet M., Hicks D. Photoreceptor organisation and rhythmic phagocytosis in the Nile Rat Arvicanthis ansorgei: a novel diurnal rodent model to study cone pathophysiology. Invest. Ophthalmol. Vis. Sci. 2006 47: 1309-18. Bobu C, Hicks D. Regulation of retinal photoreceptor phagocytosis in a diurnal mammal by circadian clocks and ambient lighting. Invest Ophthalmol Vis Sci. 2009 50:3495-502. Mehdi MK, Hicks D. Structural and physiological responses to prolonged constant lighting in the cone-rich retina of Arvicanthis ansorgei. Exp Eye Res. 2010 91: 793-9. 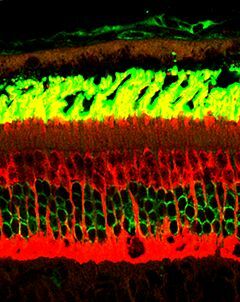 Krigel A, Felder-Schmittbuhl MP, Hicks D. Circadian-clock driven cone-like photoreceptor phagocytosis in the neural retina leucine zipper gene knockout mouse. Mol Vis. 2010 16: 2873-81. Boudard DL, Acar N, Bretillon L, Hicks D. Retinas of the Diurnal Rodent Arvicanthis ansorgei Are Highly Resistant to Experimentally Induced Stress and Degeneration. Invest Ophthalmol Vis Sci. 2011 52: 8686-700. Boudard DL, Tanimoto N, Huber G, Beck SC, Seeliger MW, Hicks D. Cone loss is delayed relative to rod loss during induced retinal degeneration in the diurnal cone-rich rodent Arvicanthis ansorgei. Neuroscience. 2010 169: 1815-30. Saïdi T, Mbarek S, Omri S, Behar-Cohen F, Chaouacha-Chekir RB, Hicks D. The Sand Rat Psammomys obesus develops Type 2 Diabeic retinopathy Similar to Humans. Invest Ophthalmol Vis Sci. 2011 52: 8993-9004.